"Thomas Fogarty Winery is one of the Santa Cruz Mountain's most respected and historic producers. The winery dates from 1978 when Dr. Thomas Fogarty, a Stanford Cardiovascular Surgeon and world-renowned inventor, planted what are now the Winery Estate vineyards. Before launching his winery, Fogarty had fallen in love with the wines of Burgundy in the 70's, and sought out cooler, mountainous, ocean-influenced vineyards that had already proven a good home for Pinot Noir and Chardonnay at such wineries as Mt Eden. The winery property, located directly west of Palo Alto and Stanford University, sits on Skyline Blvd. at a 2000 foot elevation. The long, cool growing season and excellent sun exposure provide an ideal climate for these grape Burgundian varieties. The Winery Estate includes eight micro-vineyard blocks covering 25 acres of ridge top and steep, southeast and east-facing hillsides on the property. The micro-vineyards include: Windy Hill (2.5 acres of Pinot Noir, 1970 ft. above sea level), Razorback (2 acres of Pinot Noir, 1400 ft.), Damiana (3.5 acres of Chardonnay, Damiana, 1890 ft.), Portola Springs (2 acres of Chardonnay, 1920 ft.), Albutom (0.25 acres of Chardonnay, 1930 ft.), Langley Hill (5.25 acres of Chardonnay, 1925 ft.) and Rapley Trail (5.5 acres of Pinot Noir, 1650 ft.). These parcels combine to create the Santa Cruz Mountains Estate Chardonnay and Pinot Noir, as well as a few tiny production, single-vineyard and single-site wines that are produced in 25 to 100 case lots. In addition to the Winery Estate property, the Fogarty's later planted Gist Ranch Estate in 1999. This 100-acre parcel is located 17 miles south of the winery and 14.5 miles from the Pacific Ocean and forms the base for the wines under the Lexington label. The property features 14 acres of grapes including Cabernet Sauvignon, Merlot, Malbec, Cabernet Franc, Syrah, Sauvignon Blanc, Semillon, and Pinot Gris. 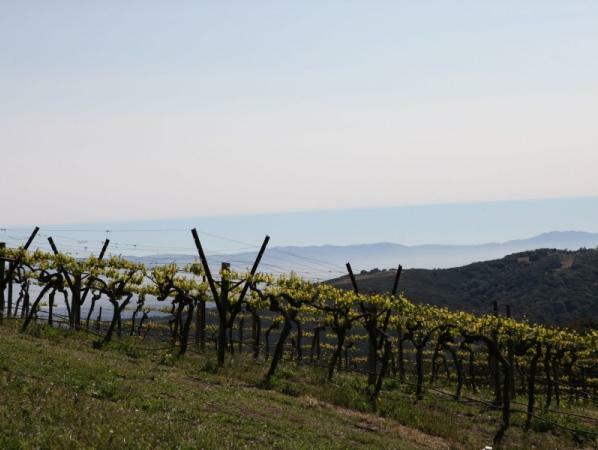 Gist Ranch sits atop a ridge at 2300 feet above sea level and, while a bit warmer than the Winery Estate, is a relatively cool climate for Bordeaux varietals and is influenced by the Pacific Ocean to the west. The long growing season produces nuanced and complex Bordeaux-styled wines in both blended and single-varietal versions. Today the winery is under the guidance of the second generation, Tommy Fogarty Jr, and Winemaker Nathan Kandler. Given the mountainous terrain, the work in the vineyards is labor-intensive. Harvest, of course, is done by hand with extensive sorting in the vineyard at the picking. Fermentations occur with indigenous yeasts on all the wines, and use of oak is extremely moderate, with no more than 25-30% of new wood. The Santa Cruz Mountains is one of the most exciting, interesting and undiscovered wine regions in California. Antonio Galloni calls it "California's best kept secret [and] home to some of the world's greatest vineyards and wines". We couldn't agree more. Not only does the region share the cool-climate, large diurnal shift qualities as some other coastal regions like the far Sonoma Coast and Santa Rita Hills. But it is also geologically diverse compared to these other regions, producing soil-driven wines that are more restrained and savory than most CA wines – even so-called "cool-climate" wines - with layers of complexity, energy and focus. Thomas Fogarty most definitely epitomizes the greatness of the Santa Cruz Mountains terroir."